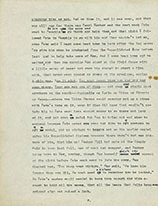 By mid-May, however, the Post rejected the revised version, though through Ober Faulkner learned that the magazine was willing to consider another revision, and within a week Faulkner sent his agent a third version (below). 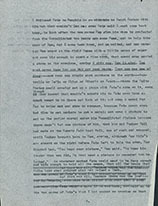 Presumably the hand-written changes made on the second page above right show him in the process of making this re-revision; all are incorporated into the page below right. These changes soften the narrator's vernacular – "git nowhere to git no medal," for example, becomes "get nowhere to get a medal." The other main change is to tighten the story a bit. 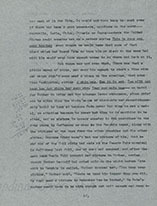 Although this revision is not nearly as extensive as the wholesale changes Faulkner made in April, Faulkner told his agent that he thought "it was all right now." 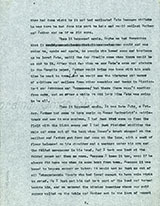 "It never had tasted quite right to me," he added; "that's what having to write not because you want to write but because you are harassed to hell for money does." In less than a week, however, the Post rejected it once more. 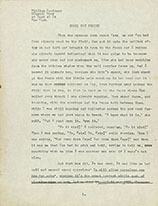 Hoping that Ober could sell it to another magazine, by early June Faulkner had revised it a third time (below). In this version the narrator's voice is much less vernacular; it begins, for instance, "When the message came about Pete, Father and I . . ." Just as Pap becomes Father, Maw becomes Mother, and so on. It's hard to know, however, what Faulkner's decision to give his narrator back the more educated English he had spoken at first was based on. Did he want to make the poor white Griers more dignified in their sacrifice, their grief and their courage? or did he think the more formal style was better calculated to sell? The other major change, the further tightening of the story, was almost certainly based on commercial considerations. 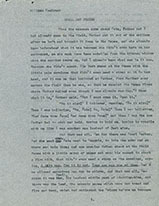 This fourth version is five pages shorter than the third one: the reference to Pete's girlfriend Docia or Doshey Tull is gone, as are most of the story's references to what happens in "Two Soldiers." 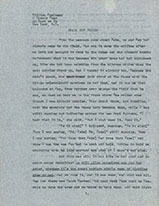 Ober had to submit this re-re-revision to many other magazines before it was accepted over a year later by Story, which paid Faulkner $25 for it. 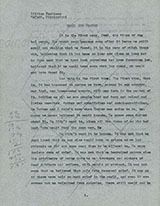 This fourth version is the one Faulkner reprinted in Collected Stories.